In this post I'd like to describe how the statistical data from the Semantic.hfi.fi service can be accessed from your web application via the demo app Areastats. Semantic.hri.fi offers several JSON/P web services which can directly be used from any website. 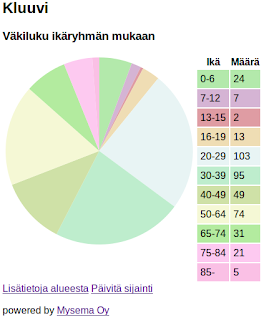 The query defines that we are interested in statistical items from the year 2010, with the unit persons (Henkilöä) and from the dataset dataset:A025_HKI_Vakiluku1962. For details on how to use the service of Semantic.hri.fi, please read the embedded documentation. The fetch_stats_success function iterates the headers of the result to find the index of the column we are interested in and the iterates over the result items and maps the column data into the DOM of the local HTML document. After that the drawpie function is invoked and the stats can be shown. This demo is related to the Helsinki Region Infoshare project, which aims to provide data of the Finnish capital region in Linked Open Data form. Feel free to contact us if you need more info on the demo or the Semantic.hri.fi services.